(CNN) -- Thousands of people in Northern Ireland protested Wednesday against the killing of two soldiers and a policeman, reportedly by paramilitaries who want the province to leave the United Kingdom and become part of the Republic of Ireland. 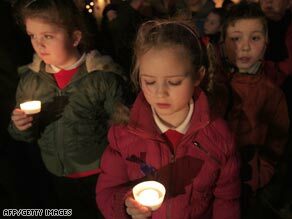 Girls in Craigavon, where the police officer was killed, join a candlelit vigil. Unions organized a 30-minute silent vigil following the shooting of policeman Stephen Carroll on Monday and British soldiers Cengiz "Pat" Azimkar and Mark Quinsey on Saturday. Vigils were held in Belfast, Craigavon -- where Carroll died -- and other towns including Lisburn and Newry. The Irish Parliament in Dublin Wednesday "utterly condemned" the murders, which raised fears of a return to the violence that Northern Ireland suffered for decades before the Good Friday Agreement in 1998. Ireland's prime minister, or taoiseach, described as the killers as "a tiny and unrepresentative group of evil people who have no mandate and no support for their actions. "Those actions are futile and tragic," Taoiseach Brian Cowen said. "The people to whom I refer cannot and will not succeed. This debate, and those taking place in other democratic assemblies, makes that abundantly clear." Police arrested two men Tuesday in connection with the killing of policeman Carroll, 48, a day earlier. The men, aged 17 and 37, were arrested separately "as a result of searches in the area," said a police spokeswoman. Carroll was the first police officer killed by paramilitaries in Northern Ireland since October 1998, the police said. The two soldiers killed Saturday -- Azimkar, 21, and Quinsey, 23 -- were the first British troops to be killed in the province in more than 12 years, the Ministry of Defense confirmed. Politicians from across the political spectrum condemned the killings, with Sinn Fein deputy leader Martin McGuinness calling the killers "traitors to the island of Ireland." Sinn Fein is a predominantly Catholic party that seeks for Northern Ireland to leave the United Kingdom and become part of the Republic of Ireland. It is widely thought to be linked to the Irish Republican Army, which fought a violent campaign against Britain for decades. "I utterly condemn this latest wicked and murderous attack by dissident republicans," said Danny Kennedy, deputy leader of the loyalist Ulster Unionist Party, which wants Northern Ireland to remain part of the UK. The Continuity IRA, a republican splinter group that does not accept the Good Friday Agreement, said it had killed Carroll, Britain's Press Association reported. The two soldiers killed at a base in Massereene, in County Antrim, were preparing to ship out for duty in Afghanistan. The victims had packed their bags, changed into desert uniforms and were awaiting a final pizza delivery when they were gunned down, authorities said. Two masked gunmen with automatic rifles shot the soldiers as the pizzas arrived at the Army barracks, authorities said. Two other soldiers and the two pizza deliverymen were seriously wounded. Another militant splinter group, the Real IRA, reportedly claimed it had carried out the attack on the soldiers. There have been no arrests in connection with that shooting. At the grass roots level, some republicans continued to feel betrayed by Sinn Fein and the old IRA leadership, who they felt had railroaded them into a dead end deal with the British that was never going to deliver a united Ireland, CNN Senior International Correspondent Nic Robertson said. A few weeks ago a huge car bomb was discovered before it went off. At that moment it became clear the Real IRA at least was back. And it was no surprise that just before the recent killings, Northern Ireland's police chief called in Britain's top army surveillance unit. The events of the past few weeks sparked fears of a return to the sectarian violence that Northern Ireland, a province of the United Kingdom, suffered for two decades before the peace deal in 1998. The conflict was between unionists, who are mostly Protestant and want to remain part of the UK; and nationalists, who are mostly Catholic and want to join the Republic of Ireland. For nearly 40 years, British soldiers patrolled Northern Ireland in armored vehicles and hunkered down in bases surrounded by concrete walls and barbed wire. Violence spilled over into the mainland UK, with the Irish Republican Army, known as the IRA, bombing London and other British cities.